This week we will look at a newly discovered (sort of) pterosaur with a really cool name. Enter Aerodactylus scolopaciceps! Aerodactylus was a pterosaur that lived in what is now Germany, during the Late Jurassic Period, around 150 million years ago. It is only known from juvenile specimens with small, roughly one-and-a-half foot wingspans. Adults would probably have been a bit larger than this, perhaps possessing about three-foot wingspans. (This is purely based on estimates of adults of similar, more completely-known pterosaurs, like Pterodactylus. Adult Aerodactylus may have been different.) Aerodactylus was most likely a meat-eater when alive, using its jaws to snap up small prey. The genus name, Aerodactylus translates to "Air Finger" but there's more to it than that. It was really named after Aerodactyl, which is a pokemon...based on a pterosaur. So to sum that up for you pterosaurs inspired the creation of the fictional character, Aerodactyl, which in turn, inspired the name of the actual genus of pterosaur, Aerodactylus. I love it! 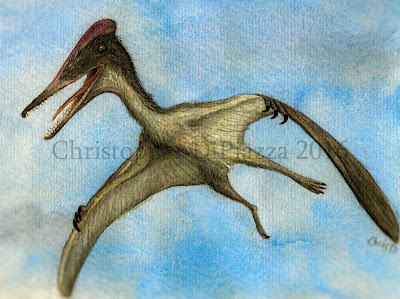 Life reconstruction of Aerodactylus by Christopher DiPiazza. 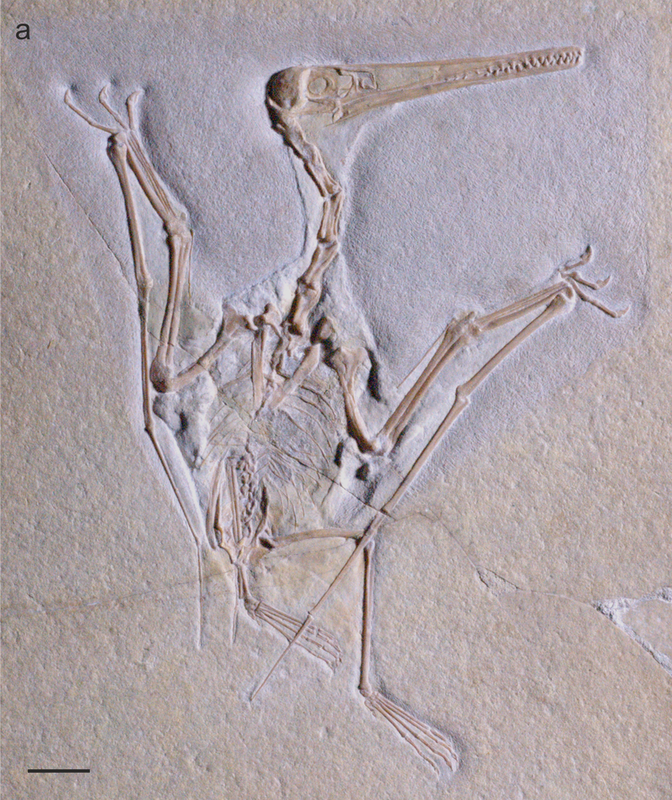 Aerodactylus was discovered and described back in the 1850s but it was considered a species of Pterodactylus at the time. The two were similar in appearance and both lived in what is now Germany during the same time period so it was easy to assume that they were more closely related than they really were at the time. In 2014 the specimens we now call Aerodactylus, were examined more closely, and were discovered to be different enough to warrant their own genus. They had a different number of teeth, which were were more sparsely arranged in the mouth, differently shaped skulls and eye sockets, longer tail vertebrae, and slightly differently proportioned wings. These characteristics seem minimal at first, but they are important. In fact, Aerodactylus was determined to not even belong to the same family, let alone genus, of pterosaur as Pterodactylus. Aerodactylus, thanks to a few very well-preserved specimens, tells us that it would have had a crest on its skull in life, webbed toes, and a pouch under its throat. All of these characteristics, combined with the fact that it fossilized in what was a lagoon of some sort at the time of its death, support the idea that Aerodactylus was adapted for living and hunting near the water. Its long jaws, with pointed teeth concentrated towards the tips could have been for snapping up small fish or invertebrates in shallow water, and its webbed toes could have aided it if it waded or swam on the surface of deeper water. Vidovic, S. U.; Martill, D. M. (2014). 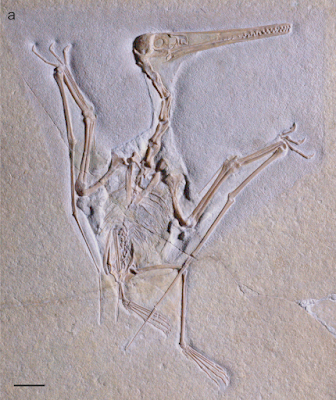 "Pterodactylus scolopaciceps Meyer, 1860 (Pterosauria, Pterodactyloidea) from the Upper Jurassic of Bavaria, Germany: The Problem of Cryptic Pterosaur Taxa in Early Ontogeny". PLoS ONE 9 (10): e110646.